You probably first heard about Tezos in 2017, when their ICO made waves in the crypto and finance worlds by raising $232 million. Although that figure has since been surpassed (notably by the $4 billion raised by EOS), it was a record high at the time. With their nearly quarter billion dollars in raised capital, Tezos has a shot at becoming a major blockchain competitor to the likes of Ethereum, Decred, and Digibyte. However, Tezos also has a troubled past, which clouds their future. Can this controversial project fulfill its promises and potential? Keep reading to find out! Arthur’s wife, Kathleen Breitman, also became involved in the Tezos project, bringing experience from her former careers. As stated on their website, Tezos is formalizing a new style of blockchain governance in which stakeholders govern the protocol. Beyond community-led governance, the core project is a new platform for smart contracts and decentralized applications, with a programming language intended to be more predictable, and therefore more reliable, than Ethereum’s Solidity. 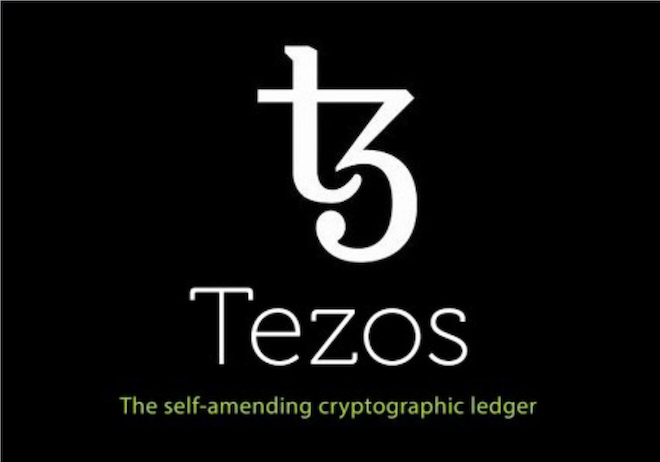 Any improvement made on the Tezos blockchain is decided by the community of Tezos token holders. Therefore, only improvements which reach consensus will be carried out, preventing any radical, top-down changes which could result in a hard fork of the blockchain. Of course, this doesn’t imply that the community will always make the right decisions. In practice; a developer will propose their protocol upgrade along with the level of compensation he or she requires for implementing the change. Tezos token holders will then vote on which changes they wish to see included. The more tokens a voter holds, the more weight their votes get. If approved, changes can be made with payment assured for the coder. Hard forks can be avoided, preventing a division of the chain and community. The protocol rewards its own community for conducting needed or desired improvements. Upgrades are made in a seamless and decentralized manner. The Tezos protocol mathematically proves the correctness of both smart contracts and decentralized applications (Dapps) which run on top of the Tezos blockchain. This should help prevent bugs in these smart contracts, which as we’ve seen from Ethereum’s history, can be extremely costly and damaging. This method allows for no third parties to become involved in the verification process, keeping the information and code secure and decentralized. The Tezos platform itself also makes sure that no third parties can censor or shut-down the applications running on top of its blockchain. Get Rich by Becoming a Baker? The Tezos blockchain still needs what Tezos calls “bakers” to validate transactions and add them to the blockchain. The Tezos website describes baking as “the act of signing and publishing blocks to the Tezos blockchain”, therefore bakers are equivalent to miners. Bakers ensure that the transactions are valid and that no double-spending has occurred. The good thing about becoming a baker is that you get to improve and continue the blockchain’s functionality while earning rewards in XTZ (Tezzies). For bakers or developers or anyone else with an interest in Tezos, there are various discussion forums available. These facilitate communication within the community, and is a good place to find answers to your questions about the Tezos protocol. The Tezos team also provides a variety of resources via their blog, Twitter , GitLab, and newsletter. As mentioned, the Tezos ICO ($XTZ), managed to raise $232 Million in 2017. This was more than any other competing ICO at the time and is even said to have kick-started the whole ICO craze. The ICO lasted less than two weeks from 1st of July 2017 until the 13th of July 2017. With the funds collected, Tezos has enough capital to grow their protocol extensively and also enough token holders to form an active voting pool. This successful token sale also boosted their name across the crypto space, bringing an increase in support and interest. After its successful ICO, Tezos experienced a lot of conflict between the Tezos Foundation and the Breitmans’ company in the US. The Breitmans had formed the Tezos Foundation in Switzerland to take advantage of the country’s relaxed banking regulations. Funds from the ICO were held and controlled by the Tezos Foundation, which became uncooperative in regards to using the funds to develop the blockchain further. There was also a delay in token issuance, with XTZ not reaching investors even months after the ICO had concluded. This was caused by friction between the Breitmans and the Tezos Foundation’s chair, Johann Gevers. They disagreed over who to hire for the Foundation, as well as who would control the Tezos website, domain, and email servers. In October of 2017, Johann Gevers was asked to step down. Gevers did not take this lightly and filed complaints with Swiss regulators. The delay in the distribution of the tokens due to all the internal conflict also sparked interest from the Securities and Exchange Commission (SEC) in the US. Tezos then became a target of numerous lawsuits and an investigation on Tezos was led by Reuters. The outcome of the legal action was that XTZ tokens were to be considered securities under US law. Therefore, they needed to be sold legally to investors and regulated by the SEC. Even so, Kathleen Breitman, speaking at a conference soon after the decision, stated that there needed to be some forward progress and that XTZ tokens should be governed under their own terms. On paper, Tezos looks to be an innovating and refreshing blockchain solution for the cryptocurrency industry. They have a supportive community that is incentivized to help improve the protocol. They also had an impressive ICO which attracted considerable funding and support. Finally, they have a strong social media presence, and keeps everyone updated on the latest developments. However, Tezos has been slow to deliver their XTZ tokens and launch their service to investors and the world. Even the best model in the world cannot run effectively if it has no practical operations. However, by June 2018, XTZ tokens have finally been delivered to investors. Tezos also has their beta network up and running at this time, but unfortunately missed the 2017 bull market. Only time will tell if Tezos can recover from the delays and setbacks to succeed.